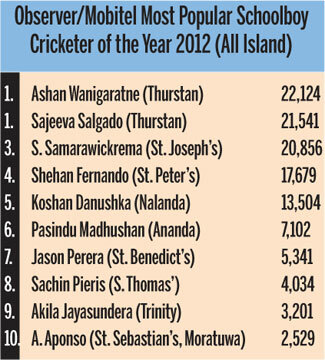 MOST POPULAR SCHOOLBOY CRICKETER: The fight for the first place between Thurstanites Ashan Wanigaratne and Sajeeva Salgado (All Island) continues and the deficit between the two are 583 votes while in the Outstation category the tussle between Maris Stella’s Angelo Jayasinghe and Vidyartha’s Ruwan Bandara is hotting up as the gap between the two is only 303 votes at the end of count number 8 in the Sunday Observer/Mobitel Most Popular Schoolboy Cricketer of the Year Contest. The readers prize were won by: 1. Sarath Peiris, 6, Weerasekera Lane, Pepiliyana. Rs. 2,500 2. D.D. 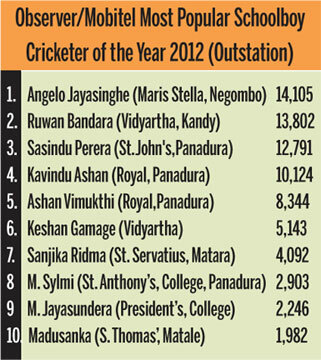 Angelo, 244/2, Dineth Place, Malabe. Rs. 1,500 3. Mihiri Shanika Jayawardhana, 430/15, Ranpokuna Mawatha, Kotte Road, Pita Kotte. Rs. 1,000.